These photos can be found in our Main Street photo library HERE. This interactive map can also be found on our maps page HERE. The flow state of downtown Honesdale, PA can be experienced by strolling around on a daily basis and connecting with the local landscape. What does a town look like after it doubles in population? In Honesdale Borough’s case, we can look to the past first. Historical estimates (various sources) have us marked at anywhere from around 6,000 to 9,000 people. Starting at a current population estimate of 4,000, we could experience a percentage change in positive growth ranging from 50% to 125% to reach these historic highs. Were these noted peaks in population sustainable? If population highs are akin to an ecosystem’s carrying capacity, then we’re currently under capacity. However, that many more people might strain the landscape’s environment and infrastructure. It might equal people living in cramped conditions or in low-wage service to those with more opportunities. Yet, diversity of job prospects at all may be something we currently have less of, alongside lesser population. It’d be interesting to find out where we could grow from here and what that version of Honesdale would look like. On the same token, it’s interesting to note what things look like now. By flipping future projections and goals built around past data back around to the present, we may better be able to understand what a place is like and experiencing, as it changes. Why are the people already here staying, creating, and expanding their families? What’s preventing others from doing the same? We often look for outside motivation but, within the local landscape, there are flashes of creative inspiration. Many pockets of capacity, leftover from a larger place’s foundation, can be turned to for reference. Nooks holding potential include vacant lots, back alleys, underutilized transportation corridors, empty upper floors, and more. Activating those nooks could include new community gardens, reoriented small businesses, new trails along old travel ways, and affordable studios for the next generation of engaged citizens. How much can we grow, from where we already are, before pulling in adjacent resources? Maybe, as Charles Wolfe suggests and we would agree, answers will bubble up, through inclusive access to organic engagement. A sense of place so strong that it’s not just a matter of calling a place your home town generally but calling a home your neighborhood specifically. A collective, equal-stakeholder spirit, imbued within individual community members that allows each of us to inherently know nothing is static. A shared knowledge that places and spaces were different in the past and will be different in the future. An understanding that we and all of the different versions of us can, collectively and individually, make or remake our present environment. With this in common mind, we can advance the benefits of these shared opportunities by crafting new forms, in ways that are respectful of one another and the extension of nature we represent. In August of 2015, a portion of the 500 block’s back alley came alive beyond what present, day-to-day interactions imply. A grassroots injection of local energy allowed an assortment of individuals to come together and share space for multiple reasons. Engaged participation in the present took place across multiple building stories and reversed storefronts. Everything being informally connected by a good, old-fashioned, public alley being utilized to the maximum potential of the moment. 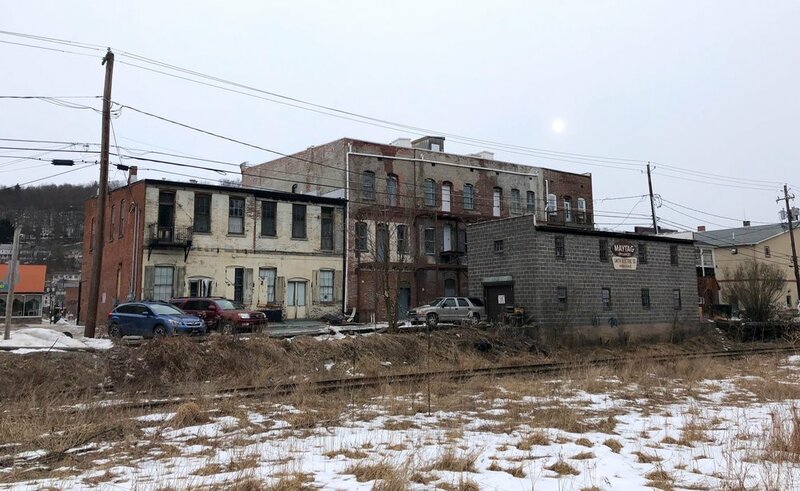 A potential, perhaps, last matched by canal days gone by, where commerce, conversation, and culture seeped into and out of town, one block over from the main street. This map, shown here and from our maps collection, is a local landscape story, told over the course of a certain time and across a string of inter-connected spaces. Thanks to everyone who attended and followed along with the NYE Ball and Dance Party we put on with Black & Brass at 6th & River. Events like this aren’t just for everybody, they are everybody’s. What’s created is what engaged participants make of it. Any given project we work on is a single piece of a grander inspiration cycle, featuring connection points to shared space and time, meant to be experienced, then carried forward as personally or collectively desired. Specifically, this dance party and ball was designed to be enjoyed in whatever ways we cho(o)se. It was a happening that incinerated in the moment, leaving dust we all danced ourselves clean of before heading back home to a new year. As always, some sparks remain, to be ushered on down the line of inspiration cycles to come. What’s next for all of us? May the creative boundaries between producers and consumers continue to morph and contract in 2019. The greater canvas of the local landscape is vast and filled with abundance. Events and projects like this one are as much yours as ours. That’s just the way we like it in festivaltown, Honesdale. Happy New Year. New Year’s Eve bar by Here & Now and grooves by DJ Jus’ Boogie. Party photos above and below by Jack Kingston. A scan of the horizon offers an abundance of opportunity. Each frame of reference highlights creative potential. Slightly shifted perspectives and the application of engaged participation within the landscape can transform what is and what was into what we’d like something to be. This can be a temporal re-framing, activating a nook in time. This can be a spatial re-framing, activating a nook in three-dimensional space. This can be a programmatic re-framing, activating a nook with alternative uses. Any and all and more are part of what’s freely and commonly available. Take a stroll around your neighborhood. Note how it currently exists. Uncover how is previously existed. Consider what it could be going forward. Ask yourself, what if Honesdale (or your neighborhood) … ? How can things be made better by you and your neighbors, for combined benefit? Discovering the answers to these questions is empowering. Once nooks of opportunity are identified, they can be found everywhere and we all have agency for change within us. It’s an inclusive, permission-less ability shared in an open source environment. Someone answers one question with the community in mind; then, all of a sudden, you’re in the teller line for a banking errand and the village backdrop is a lot more engaging than it once was. An elevated, downstream-facing, slightly hidden, vertical space has been transformed in an unexpected way. Making a deposit in front of large, historic windows becomes exciting, like stepping into an alternate dimension. The commonplace all around us that once felt static and gray becomes alive with color. An objective, experiential pleasure doubles as a reminder. There are nooks all around us, ready for activation. We can build things up without tearing things down. What is it you’d like to create out of your and your community’s innate potential? What are the boundaries of the place we call Honesdale? Community boundaries can be defined by a zip code, polling place, shopping preferences, family homestead, or something else entirely. Sometimes boundaries are clearly expressed and other times entirely amorphous. Definitions can change over time or depending on who you ask or under what context. This is partly the nature of making maps. No maps fully illustrate reality. All maps are a representation of reality, capturing a concept or phenomenon or feeling. There's a certain mystery in that and it balances out the perceived authority any given map portrays. Connections to our community grow vertically as well as horizontally. That's why Honesdale's boundary can be described in a fairly straightforward way (in municipal government terms) yet, equally described in an intangible way (in terms of community identity). The H'dale boundary map we recently made illustrates this dichotomy. Portion of the Honesdale Boundary Analysis map. We're fans of reality's hidden layers, nooked within the habitat of our human-built environment. Our Maps page is full of examples. Our event and festival projects are equally steered into these open spaces. Driven by a shared inspiration cycle designed to create something out of nothing yet, anything out of everything else, each festival or event is an attempt to activate a shaded corner of our shared universe in the 18431. That brings us to the Canaltown Moving Movie Festival. Our new festival might be easy to describe in terms of what it is (a movie festival) but it'll be tough to draw a boundary around. This fest will take place at multiple venues throughout town. Attendees will be able to see every movie by watching sets in whatever order they like and choosing their own festival adventure. Like Spookyfest, there will be international selections alongside local creations, albeit exploded into chunks and coordinated for multi-part discovery downtown. The Moving Movie Festival map may look different every year and the schedule may eventually cover multiple days but the plan is to make it feel like the whole town is alive and collectively "up to something" each and every time. This year is round one of connecting the dots in new and exciting ways. Like in many places, going out to the movies disappeared here for awhile. Honesdale's grand, Main Street portal to the celluloid frontier was disassembled years ago. The pieces were spread out among movie rental shops and home theater systems, while the site itself became a gas station convenience mart. Eventually, a local mini-plex brought the silver screen back to the outskirts of town. The inherently local connection to movies in the heart of our community, however, was lost. There's a lot to be said for a movie theater on your Main Street. In some cases, it's a testament to legacy preservation. Old town theaters were 'the' source of entertainment at one time. To keep a theater standing through the generation of investment and engagement that favored highways and spreading out over town centers and focusing on what you've got takes commitment. In some cases, it's a testament to perseverance. There are likely as many, if not more ways to enjoy cinematic creations than there are theaters in any given, regional geography. To keep a theater operational through the generation of home and mobile entertainment takes even more commitment and passion. Choosing to go out the movies is choosing to connect with the universe through the creative use of lights and sound, alongside your friends and neighbors. This involves an openness to explore and share with a group and this involves the focused attention we're easily distracted away from at home. These are the seeds of community engagement being germinated. Germination by active participation, rooted in choosing to do something more involved and demanding of yourself than other options. What if we recreated our community's culture of cinema by rebuilding our downtown movie-going infrastructure? A special movie event here... a showing of something unique there... an annual film festival a few blocks in that direction... What if we collected the pieces spread out years ago and reassembled them into something new that's reminiscent of something old? What might that look like within our local landscape? We've got some ideas. Where could that lead? We'd like to find out by activating some nooks and projection-lighting up the alleyways of the ol' 18431.